Product #15620 | SKU MB_CG-X-BM1 | 0.0 (no ratings yet) Thanks for your rating! 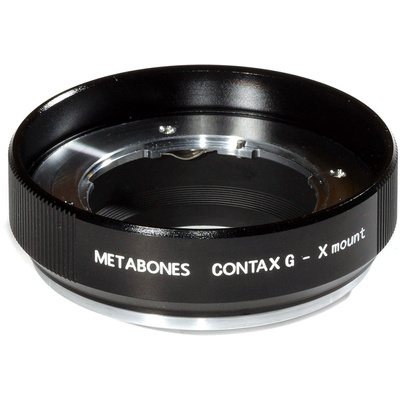 The black matte Contax G Mount Lens to Fujifilm X-Mount Camera Lens Mount Adapter from Metabones allows a Contax G mount lens to be attached to a Fujifilm X-Mount camera. Metabones adapters are quality made, using precision-machined brass with chromium plating on both the camera-body and the lens sides of the adapter in order to ensure smooth mounting, quality aesthetic, and durability. Although the lens will fit physically, automatic diaphragm (AE metering), or other auto functions are not retained using this adapter. Metabones uses a special matte-black treatment to keep internal reflections to a minimum in order to maintain the maximum optical quality. The adapter features a unique ultra-wide manual focus ring with smooth focusing action. The focus ring allows compatibility with the following lenses: Zeiss Biogon 21/2.8, Zeiss Biogon 28/2.8, Zeiss Planar 35/2, Zeiss Planar 45/2, Zeiss Sonnar 90/2.8 and cameras: NEX 7, NEX 5N, NEX-C3, NEX FS-100, NEX-5, NEX-3.